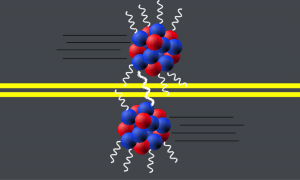 Lead nuclei accelerated by the LHC will create a “spray” of photons. Nuclei that don’t get quite close enough to collide can still feel the effect of photons from oncoming nuclei. These grazing interactions will sometimes produce new particles that can shed light on the structure of nucleons. No image credit. Recently I wrote about how protons that don’t quite collide in the CMS detector can still result in photons splitting off and interacting, sometimes even producing heavy particles. That result was obtained from data collected during the Large Hadron Collider’s most frequent operating mode: colliding high-energy protons. The LHC can run in several other modes, including hurling lead nuclei at each other to study exotic states of matter. As with the proton beams, a tiny fraction of these lead nuclei get just barely close enough to each other to interact without colliding. And just as with grazing protons, these grazing nuclei can interact via the electromagnetic force and produce new particles. It was in 1924 that a 23-year-old Enrico Fermi wrote a paper titled “On the Theory of Collisions Between Atoms and Elastically Charged Particles.” At the time it was known that if you sped up the heavy core of an atom, its nucleus, it would generate an electric field in the space around it. Fermi argued that you could think of this electric field as a collection of virtual photons, the number and energy of which were dependent on the size of the nuclei in question and how fast they were moving. You can think of the nucleus as a heavy truck driving on a wet road. The bigger the truck (and thus more numerous and larger its tires would be) and the faster it moves, the bigger a spray (the photons, in the case of this analogy) that it kicks up. Hurling an atomic nucleus to speeds close to the speed of light will kick up such an immense spray of photons that they might even hit a truck traveling in the opposite-direction lane. What actually occurs is that a photon from one nucleus will interact with an individual proton (82 of which adorn each lead nucleus) from the drive-by nucleus in the opposite direction. As in the case of grazing LHC protons, the interacting photon has sufficient energy to produce entirely new particles, despite leaving the parent nuclei largely intact, save for a few neutrons that get dislodged. CMS scientists looked for such near-collision events in the LHC’s 2011 heavy-ion run, during which lead nuclei were accelerated to an unprecedented energy of 574 trillion electronvolts. The CMS team was looking specifically for evidence of J/ψ mesons, particles that are bound states of two charm quarks. They performed this search by looking for unusually quiet events recorded in this run that had the possible decay products of only a single J/ψ meson and a few errant neutrons striking the very forward reaches of the CMS detector. In their recent paper, the CMS team presents the characteristics of the J/ψ mesons recorded in the near-collisions of lead nuclei. Physicists have devised different models to explain what the internal structure of the protons that make up these lead nuclei are like at high energies. As the photons that interact with these protons are effectively probing this structure, the characteristics of the resulting J/ψ mesons can literally shed light on aspects of this internal structure.